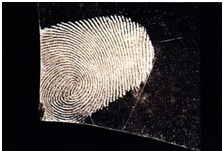 When attempting to retrieve evidence at the scene of a burglary, the CSI or forensic scientist needs to mentally step through what the burglar did, thinking all the time about points of contact and what evidence they might have left. In distraction burglaries, entry might be gained by a trick such as asking for a drink of water, and it’s important to identify this method immediately, because there may be physical evidence opportunities directly connected with the MO. In addition, UK Police forces keep intelligence records of burglary teams operating in their Force area and can link burglaries by method, building a picture of the perpetrators, and linking crimes. But for break-in, we usually start by identifying the point of entry; this may not be at all subtle – in older properties simply ‘shoeing in the door’ works regrettably well. Despite the obvious risks, many burglars still don’t use gloves, so if they broke a window, there might be fingerprints on the glass (especially on pieces found outside) or on the window frame. Footwear marks may be present outside, at the point of entry itself, and especially inside, particularly on smooth surfaces. If the door has been kicked in, or a wheelie bin used to get up to a transom window, there are likely to be good footwear marks, so CSI will protect them from the weather and from being overtrodden. Even if the burglar did use gloves there may be fibres from those, or from other items of clothing, caught on jagged edges. 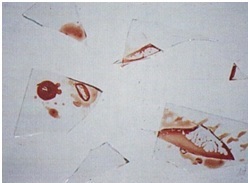 It’s hard to guard against leaving traces of DNA as we all shedding flakes of skin or hair, and if the offender was cut gaining entry, he might also have left traces of his blood on the broken glass of the window, or dripped inside or outside the house. If a door or window was forced there may be instrument marks from a pry bar or similar, and housebreakers will often re-use screwdrivers, chisels, etc. for months allowing scientists to link many scenes together.